Ensure your meal presentation is always precise and creative with this Ateco 4901 3" x 1 3/4" stainless steel round food mold / ring mold! Made of high-quality stainless steel, this unique item is durable and built to last. This mold ensures consistency of size and shape, while also cutting down on preparation time when compared to hand-molding. Additionally, it assists with portion control and therefore helps you to prevent waste and save on food costs! I’ve been wanting to purchase this product for a while it’s great for molding rice and adding a little height to dishes such as salads . Great mold that we use for Tuna Tartare easily elevates the quality of the dish and enhances the dining experience. Also helps with portion control. We ordered several different Ateco shaped molds for various plating needs. They are all good value for the money spent and should last us a long time. I use this mold for plating (cheesecakes, confit byaldi, etc.) and it's absolutely perfect. It's just the right size and need and the inside seam doesn't get in my way. This is absolutely perfect for me. Knowing it's form Ateco, I expect it to outlast any cheap ring mold you can find. These baking molds are perfect for shaping small desserts or baking cookies that will come out the exact same shape and size. Very sturdy and easy to clean! These are a heavy duty ring mold that stands up to the usual kitchen abuse, and still perform well. Stainless, of course, and super easy to clean and store. I've searched for better prices but these round forms are always expensive but you get what you pay for because we've never had one become misshapen. Extremely well crafted. It's not a thin piece of sheet metal with rivets like a cookie-cutter; this is a solid piece of metal that holds it shape without flexing. These forms are great for creating plating shapes for rice, salsa, etc. They are also not so sharp that pressing down on them (for biscuits, etc) will hurt your hand. Great form forming cold salads. Holds up very well. Also use for shaping pastr. Perfect size and very easy to use. Allows me to quickly have shaped rice pilaf for service. What can I say about a ring mold in 25 words. This mold does what it is supposed to and is sturdy and reasonable. Yup! 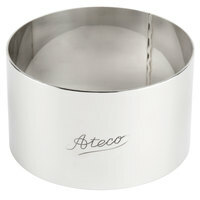 I use this Ateco 3" Stainless Steel Round form to mold butter. It works perfectly! Butter comes out easily with a quick run around the form with an icing knife. These are by far the best ring molds that I have been able to find on the market. They provide excellent consistency for our individual cheesecake and chocolate cake desserts while also holding as scratch and rust free after the MANY times that they have been washed. Creates and shapes foods well. Edges help with getting an accurate cut and releases food well if oiled or floured to prevent sticking. Still haven't used it fully how I'd like, but the times I've used it, it has delivered. I've used it for multiple different things beside plate presentation purposes. These are of really good quality and have been in great condition after a few washes so far in a high temperature dishwasher. Although slightly shorter than preferred, we use 2" acetate to increase the height slightly and it works just as great. We use these forms for molding mac n cheese, mini salads, rice pilaf and other squishable fare. They hold up quite well and don't tarnish after washing. High quality for the price. Been washed, and scrubbed many times and no tarnish or rust. Well constructed and the seam is nearly invisible.I plan on buying 11 more . This round form is sturdy and beautifully made. It turns out authentic looking scones that delight my next door neighbor from New Zealand. It is sharp and cuts easily through dough and baked cakes and bread. It has so many uses for preparing both appetizers and desserts. I am so happy I bought it. Ate one and Webstaurant are to be commended on this kitchen tool! We use these rings for making crumpets, plating foods, and most recently (after we mistakenly overcooked a batch of expensive basmati rice) delicious rice cakes! They are very sturdy. Very thick sturdy metal, it is a much higher quality than I expected for just a ring. Makes my tarts nice and consistently shaped for a clean presentation. Have owned this form for approximately 9 months. Very well built and maintains it's shape with excellent quality. Non stick spray is required for easy clean up. I'd definitely order again. This is a very sturdy and good quality round form. It won't bend like cheaper ones so this will last well in a commercial setting. I was very impressed by this little three inch round form. It was thicker than expected, the form is very round, and the top and bottom are very flat. It works great for baking single-serving cakes. Lightly greasing the rings (so the parchment will stick) and then lining them with parchment paper makes the cakes slip out easily after baking. We now have 90 of these rings and they work exceptionally well. They are very durable and clean easily. We would recommend them for cakes as well as plating rings. Love this little tool for making many different kind of recipes. Works great for making perfectly round eggs for english muffin sandwiches or tuna and avocado towers for an appetizer. Great price. Makes my side dishes - rice, look like they were plated by a pro. Slides off the rice easily and easy to clean. Great for attractive entrees and deserts. Also can be used as a larger biscuit cutter. I have used it also to cut out doughnuts to fill with Bavarian cream. One of the best prices we have seen for these round forms. We use ours daily in the pastry kitchen to make many items on our menu. We were using a different brand prior to this and we're very satisfied with this purchase. It's durable and solid compared to others so these will last a long time. Love the Ateco 4901 3" Round Form I recently purchased from the WEBstaurant Store. Perfect 3" size to cut out my Cranberry Orange Scones. The sturdiness of this item is the same fabulous quality I have come to expect for Ateco. The WEBstaurant store makes them so affordable. Will be also using this form to old desserts. Solid construction and multi-purpose: you can cut out 3" circles to make cookies, mini pies or any other form you need in a uniform circle of 3" diameter. I also have used it in the oven as a mold for a mini bread bun. It was very easy to remove the food from the mold and clean up was quick. This round form can be used for so many things, such as building entremets or mini cakes. I love building mini cakes with this mold. This 3 inch round form is perfect for cutting out doughs!! Great for making chocolate curls too!! Works well for making round loops of crisps for garnishing! !